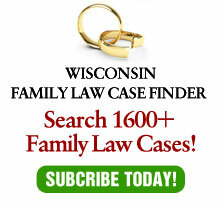 Wisconsin law allows a court to reduce child support where the paying parent has placement at least 25% of overnights and is ordered to “assume basic support costs in proportion to the time that the parent has placement of the child”. In addition, the court must assign responsibility for variable costs for the child in proportion to the share of physical placement. The problem is that variable costs are amorphous and disagreement can lead to future litigation. Therefore, a Wisconsin Court of Appeal case, Rumpff v. Rumpff, 2004 WI 197, 276 Wis. 2d 606, 688 N.W.2d 699 held that a trial court has discretionary authority to not apply shared time formula where it recognized the potential for future litigation over variable expenses. This case is perfectly consistent with Rumpff, (which leads to the question of why it is not a per curium decision). Interestingly, depending on the amount of variable expenses, it is possible that this may be a better order for the payor than paying additional child support. Interestingly, in Smith, the appellate court was not concerned about that (as shown when it never followed up on a request that the mother prepare a budget for variable expenses). Rather it was rightly concerned about the possibility for future litigation. As I’ve frequently argued, once their basis needs are met, children are better served by peace between their parents rather than any additional amount of support. Given the amount of litigation which can be triggered by a variable expense order, this case, while nothing new, is certainly appropriate.